At The Collins Law Firm, P.C., in Naperville, Illinois, we offer exceptional legal representation and support in a variety of practice areas in order to help you with all of the serious and pressing legal issues affecting your life and livelihood, your property, and your business. Serving a diverse range of clients throughout DuPage and Will counties and across the greater Chicago metro area, the attorneys at our law firm have decades of combined legal experience, and we have earned numerous awards and honors for our impeccable professionalism and service. Handling all types of personal injury and wrongful death claims, our legal professionals are fully prepared to fight on your behalf and help increase your chances of obtaining the full amount of compensation you deserve for the injuries and losses you suffered as the result of a car accident, medical malpractice, nursing home abuse, a slip-and-fall accident, or any other act of negligence or wrongdoing. Over the course of our history, we have secured millions of dollars in settlements and awards for our plaintiff clients. Through our environmental law practice, we can help you protect your rights and recover proper restitution for issues involving environmental contaminations, vapor intrusions, air pollution and illnesses resulting from toxic exposure. In addition, our business law practice provides invaluable counsel to business owners dealing with high-stakes litigation that threatens their companies as well as transactional support, real estate matters, banking and finance, and more. 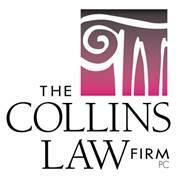 Nationally recognized as being among the best legal practices in the country, The Collins Law Firm, P.C., has the resources you need to help you face your legal challenges head on and secure a brighter future for yourself and your family as well as your business. To find out more about how we can best serve your needs, you can call our office or visit our website to schedule a free initial consultation.